On Friday, July 8, 2016—exactly 31 years to the day that I began my career on Wall Street—bond yields hit a record low and stocks were within a whisker of their record high. Going back to the first borrowing by the U.S. government of $19.6 million in February 1790, the yield on the 10-year Treasury note fell to a record low yield of 1.366%. 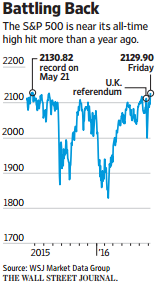 And the S&P 500 closed at a price of 2,129.90—or just a point below the record closing high of 2,130.82 reached on May 21, 2015 (when the 10-year had a yield of 2.19%). Coincidence? Maybe not. At an S&P 500 dividend yield of 2.17% (based on a trailing ~$44 annual dividend divided by a 2,130 S&P 500 price) the yield differential between stocks and bonds was positive 0.80%. In other words, the S&P 500 is paying you 80 basis points more in current income annually than the 10-year Treasury. Until the recent drop in Treasury yields, this yield differential had been half the current level (which was already anomalous). Here’s another way to think about this relative yield relationship. If you were to reallocate assets from the 10-year Treasury to an S&P 500 index fund, over the next 10 years (at current levels) you would enjoy 58% more current income plus 10 years of dividend growth, earnings growth, and the potential for capital appreciation from the stock portfolio. 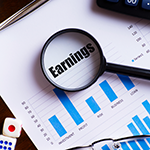 Let’s dig a little deeper and start with dividend growth. 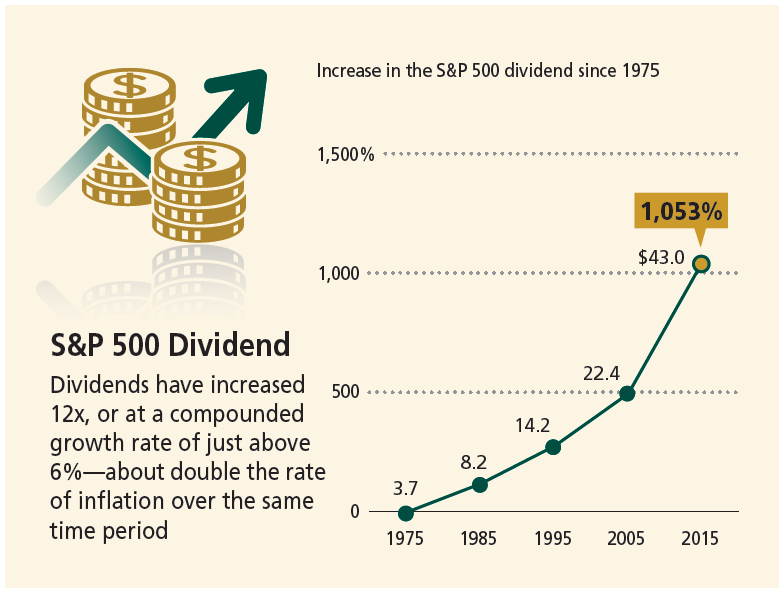 Historically, dividends have grown by about 6% per year or about double the rate of inflation over the same period. And therein lies the real beauty of dividends: Unlike Treasurys, which provide income only (and most of which, at current yields, is now wiped out by inflation), common stocks have historically generated income and growth in that income, resulting in the preservation and growth of purchasing power over time. Looking at a more recent 25-year period (1990-2015), according to data from Yale economist and Nobel laureate Bob Shiller, dividends grew at 5.40% annually compared to a 2.46% annual increase in inflation. At these trendline growth rates, over the next 10 years the dividend would increase from $44 to $75—or an increase of around 70%—compared to a rise in the cost of living of only about a third. As always, past performance is not, and never will be, a guarantee of future results. Now let’s turn our attention to the earnings yield of the S&P 500 in relation to the yield of the 10-year Treasury. According to FactSet, the consensus earnings for the S&P 500 in calendar year 2016 is just under $119. At an S&P price of 2,130, this is equivalent to an earnings yield of 5.6%—or about four times that of the 10-year. But a comparison of yields can be a type of funny money abstraction. Cash flows—specifically how long it takes you to recoup the cost of your original investment—provide a more concrete way of understanding this concept. If earnings were to never increase from the current level of $119, it would take about 18 years to recoup the recent S&P price of 2,130. 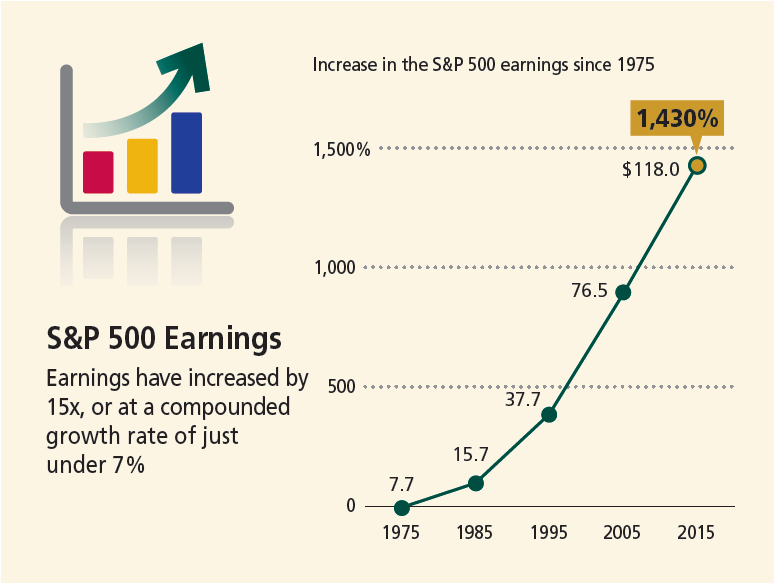 But as the chart below illustrates, S&P 500 earnings have in fact grown by just under 7% annually over the last 40 years. By stark contrast, at a constant yield of 1.4%, you would need 71 years (more than the typical investing lifetime) to recover the cost of your investment in a 10-year Treasury note. And if you want to get really silly, according to Bank of America Merrill Lynch, it would take 107 years to double your money from a one-year U.S. deposit account, such as a certificate of deposit. To recap: Even at its record closing high, the S&P 500 provides (i) a dividend yield that is over 50% higher than the current 10-year Treasury yield (2.17% vs. 1.37% as of July 8) and (ii) an earnings yield of 5.6%, which is four times higher than the 10-year yield—which itself is close to zero after adjusting for inflation. From an asset allocation perspective, the case for equities is compelling.